Eric Helleiner is Professor and CIGI Chair in International Governance at the University of Waterloo, Canada. His research focuses on International political economy, international money and finance, North-South economic relations, history of political economy. He is currently a Trudeau Fellow, and CIGI Chair in International Governance as well as Co-Editor (with Jonathan Kirshner) of the book series Cornell Studies in Money. 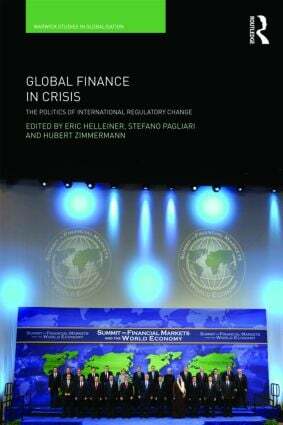 Stefano Pagliari is PhD Student in Global Governance at the University of Waterloo, Canada. Hubert Zimmermann is Acting Professor of Comparative Politics at Heinrich-Heine University Duesseldorf. He was DAAD Visiting Associate Professor at the Department of Government, Cornell University from 2003 to 2008. He also worked as editor of German diplomatic documents at the Auswaertiges Amt, Bonn. His research interests include the history and politics of transatlantic relations, German postwar history, European integration, and international monetary and trade policy. The Routledge Studies in Globalisation series is edited by André Broome (University of Warwick, UK) and Leonard Seabrooke (Copenhagen Business School, Denmark). Based in the Centre for the Study of Globalisation and Regionalisation at the University of Warwick (www.warwick.ac.uk/csgr), the Routledge Studies in Globalisation series examines key questions related to the theory and practice of globalisation and regionalisation. The Series has an interdisciplinary focus and publishes research that is methodologically and theoretically rigorous and which advances knowledge about the changing dynamics of globalisation and regionalisation, global governance and global order, and global civil society.